Due to technical difficulties, Cora Cooks has been lost in cyberspace for a while, but we are back on line and up and running again. Check back for more posts coming very soon! In the meantime, I'm still clinging to the last few days of summer with this wreath I crafted with inspiration from Pinterest, of course -- where else? In fact, with free time on my hands, I've sort of gotten back into crafts. There are so many wonderful ideas and I've pinned ALL of them to my many, many boards. Too many boards? Really? Can there be too many boards ... or too many pins? Just look at this wreath and tell me which pins to leave out and I'll think about cutting back. 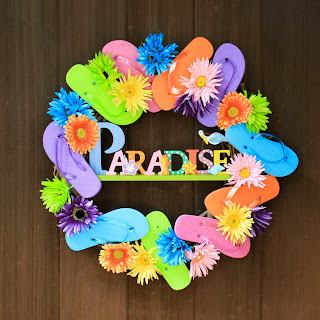 Oh, I almost forgot, the wreath is simple to make: 1 large grapevine wreath, inexpensive kid-size flip flops in bright colors, tops cut from stems of bright fake flowers, a suitable wooden sign to span the diameter of the wreath (I got mine at Hobby Lobby) and a hot glue gun. That's it! Thanks again, Pinterest and my Wreath Pinboard.